Learning2gether has been on a long break while my wife and I have been focused on uprooting ourselves from the UAE, our country of residence for the past 21 years, and getting situated in a new country, Malaysia. Routine and workflow have been pretty much shattered, getting established in a new apartment and installing wifi, while awaiting a shipment to arrive with things we couldn’t pack into suitcases, just getting around shopping and exploring on public transport and Grab, have all been insanely time consuming. As someone who has been developing personal learning networks and training other teachers to reach each other online (through example) and (by extrapolation) their students, my thoughts for supplementing income have turned to one of the places my passion has been, and where I have been spending a lot of my spare time since the turn of the century, the online teaching environment. And when you check your mail you find a link where you can actually “download now” and what you get when you do that is a larger version of poster shown in the graphic to the left of “Get the List” in the step previous to the last one. G Suite, Symbaloo EDU, Remind, Seesaw, Quizlet, and USA Learns. I was learning already. I was interested to see how Jacqueline does it. 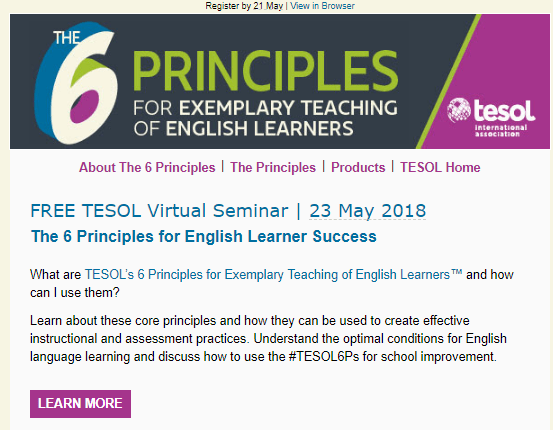 So far I’d learned that you could use a list that goes out to all TESOL members who subscribe to it to drive traffic to your site and find out who was driven there by offering them something they could download for free. Registration for the course was free as well, so I carried on. Welcome to the 5-Day ESL EdTech Jumpstart Challenge! I’m so excited you are here! Using technology with adult ESL students who have limited digital literacy skills can be a daunting task, but it’s an essential piece of their education to pursue further education and become effective in today’s workforce. Plus, the ability to use the internet and apps like Skype and Whatsapp gives our students access to staying in touch with family and friends in their home countries. My goal during this challenge is to simplify your classroom technology implementation process to help you overcome the overwhelm and avoid some of the hurdles that I have faced over my many years of using technology with my students. Throughout this week-long challenge, I’ll show you how to organize your educational technology tools and websites, lay down some foundation to scaffold your students’ learning, and get students learning English on their devices. Each weekday morning, you’ll receive an email from me with the day’s lesson and a few short activities. The orange button takes us to a closed group, so no point in posting its URL (if you want it, follow the steps above :-). In all about 30 people had joined the group, including me. You can see in the group’s postings that the group was formed on June 30 and then activated for the first iteration of the course Aug 24-28. On Sept 17 the group graphic was updated to give the current dates for the second iteration of the course. All the materials for the first iteration are posted between the announcements of the two sessions and are repeated above the second Jumpstart announcement. Participant comments on the materials (the six tools mentioned above) appear below the graphic identifying each day’s posting, so you can see the participants’ questions from the two sessions and Jacqueline’s responses. Participants’ introductions appear under the “first post” (under the Welcome, introduce yourself graphic), so a complete record of the course milestones (not the content, see below) and its interactions are, as far as I can see, preserved here. The mails for day 1 and day 2 ended up in my spam folder so I was slow getting started until the third one arrived and I was able to retrieve them (another participant had noted that he was confused about “how this works” but it was quite straightforward if you were getting the emails). Of course, the links to the actual videos on YouTube are in the email which you receive when you register for Jacqueline’s course. They do not appear at the Facebook group, so to get them you must register and have them sent to you. The only thing that appears at Facebook is an icon such as the one you see above for each day of the course. Participants are asked to post their questions or comments each day below the matching icon on the Facebook page. So to answer the above-mentioned participant’s question, this is how it works. You respond to an invitation to join the course wherever you happen to see it. You register your email with Jacqueline by requesting a free download, or by whatever way you approach the course (I’m not sure what the other ways are; I found it from a TESOL Community list). 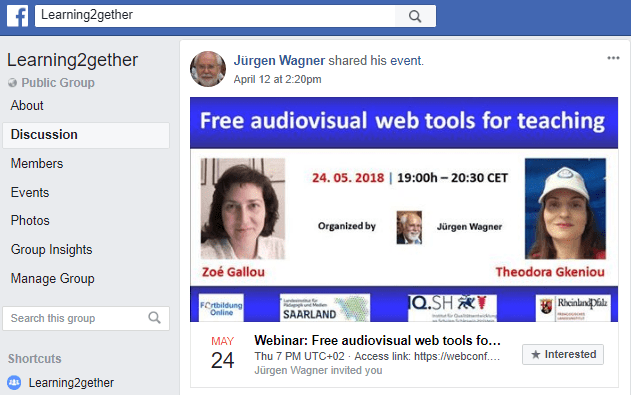 If you join the Facebook Group (or the course in some other way) then Jacqueline sends you emails giving you links to the content of the course (the videos). You watch the videos, carry out the tasks, and post on your comments on completion of those tasks at the Facebook group. As Jacqueline says in her first email, Simplification is Key! And this is pretty simple – and I would say, for what it is, successful. Full disclosure: I did not view all the videos or complete any of the tasks – I am already familiar with most of these tools (I really should go back and review the ones I don’t know, like .. Remind?? … please remind me later :-). I am writing this because I became intrigued about the way Jacqueline structured her course and presented it. It seems as if she is experimenting with deployment and modeling her experiments as a guideline for others to follow or elaborate on. That was my takeaway, all worthwhile, and if you’ve been away from Learning2gether lately, as I have been, welcome back! Our 2018 Global Education Fair is next week, April 30 – May 4!Looking to take your school global? Working on a classroom global-connection project? Come learn about and connection with global organizations and projects in our free, virtual, online exhibit hall for teachers and school districts. Registration (free) is required. The Global Education Fair (GlobalEdFair.org) is modeled after traditional vendor or college fairs, but takes place entirely online, allowing participants from all corners of the world to access information about the best global education resources and programs. We have over 45 organizations, groups, and projects signed up to exhibit! The “exhibit hall” will be open for viewing the whole week starting Monday, April 30th, to learn about the work of leading global educators, companies and nonprofit organizations from their description and video previews. 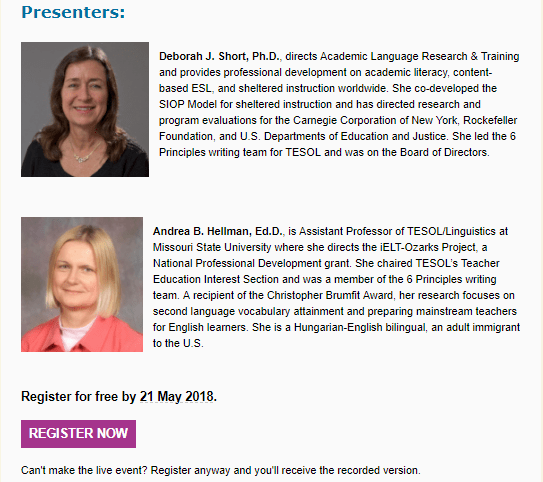 Live chat will then be available on Friday from 2:00 – 5:00 pm US Eastern Daylight Time (click for your own time zone)–you can click into live virtual session rooms to talk or ask questions of organization representatives to find out about their tools, services, projects, and programs related to globally connected teaching and learning. Looking to take your school global? Working on a classroom global-connection project? Join us live on Friday, May 4th, for the Spring 2018 Global Education Fair, a free, virtual meet and greet for teachers and school districts to connect with global organizations and projects. The Global Education Fair (GlobalEdFair.org) is modeled after traditional vendor or college fairs, but takes place entirely online, allowing participants from all corners of the world to access information about the best global education resources and programs. Come explore and learn how Augmented and Virtual Reality has the power to transform learning in your classroom! Virtual Reality (VR) can transport your students all over the world, into outer space, and beyond their imagination! Augmented Reality (AR) bridges the real and digital world by letting students literally see and manipulate what they are learning in the palm of their hand. Take your students Virtual Anywhere! Michael Fricano is a Technology Integration Specialist for the Education Innovation Lab and a Makerspace educator at ‘Iolani School in Honolulu, Hawaii. Previously, he was a 4th/5th grade teacher from 2007 to 2010 and a Technology Coordinator from 2010 to 2014. From 2009 to 2014 he helped transition a public elementary school in Hawaii to become a Google Apps for Education school, which included providing Google Apps training for teachers and students, and taking on the role of Google Apps Super Administrator. He is also the Director of Social Media & Community Engagement & Teacher Architect for The Janus Group. He became a Google for Education Certified Trainer in 2014 and has been providing professional development to public and private schools and at conferences for more than 7 years. He currently serves as the President for HSTE (Hawaii Society for Technology in Education – ISTE affiliate). Michael has a passion for education, technology, MakerEd, coding, AR/VR, reading, nature, video games, the internet, and TV. Michael’s goal is to help provide educators and schools all over the world with the knowledge and skills to effectively integrate technology into their classrooms and to help their students become positive role models and contributors to the world (real & digital) around them. On the Classroom 2.0 LIVE! site (http://live.classroom20.com you’ll find the recordings and Livebinder from our recent ““Global Collaboration through Online Experiences” session presented by Sara Malchow. Click on the Archives and Resources tab. The last decades have brought a vast change in the way the students learn. The use of screens is so broadly expanding, that educators cannot disregard this fact. Furthermore, it is strongly supported by several researchers that the audiovisual web tools could help students to better understand the teaching materials and to improve their knowledge and creativity. They also have proven to be really useful for students with special learning needs. help their students revise their lessons. Select the option “Enter as a guest” and enter your full name into the box. (All attendees are “guests”). “Smartphones are not the answer!? The grand edtech buzzword bingo” provides an overview of edtech myths & misconceptions (especially mobile learning) presenting hands-on toolkits taken from “Mind the App 2.0” for smartphones aficionados but also edtech critics who would like to explore the full potentials of smartphones without the bling-bling tech fuss. – Which trends are promising? – Which innovations are digital voodoo? – What should a language teacher know? 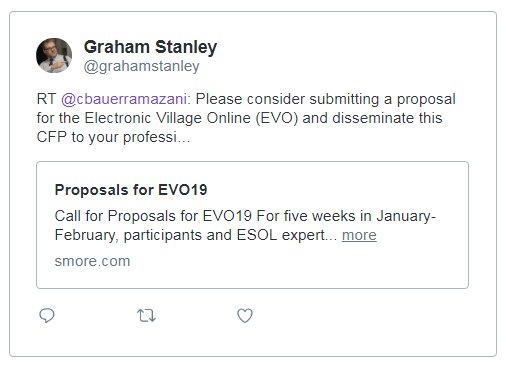 Professor of language methodology and technology-enhanced learning and teaching and head of the department of Continuing Professional Development and Educational Cooperation at the University of Teacher Education Vienna. Language teacher, teacher trainer, ELT author, international speaker. MM12 will take place from May 1 – 31, 2018 on Moodle for Teachers and Moodle for Managers. The purpose of the MOOC is to connect educators for instruction and learning, reflective practice, social and collaborative learning, cultural exchange and peace, personal and professional development, community building, best practices and challenges involved in teaching with and without technology, student engagement with the content, peers, and the facilitator, and learning to teach online with Moodle course and learning management system. In week 1, you will get acquainted with Moodle MOOC 12, the Moodle layout and pedagogy, the participants, and Screencast-o-matic and SlideSpeech video tutorial tools. start teaming up to develop a collaborative course in the practice area in weeks 3 and 4.
understand Moodle as a platform designed for authentic learning and pedagogy of engagement. Please join us and invite your face-to-face colleagues and share the course link in your social networks and online communities. We’re excited to announce our second Library 2.018 mini-conference: “Blockchain Applied: Impact on the Information Profession,” which will be held online (and for free) on Thursday, June 7th, from12:00 – 3:00 pm US-Pacific Daylight Time (click for your own time zone).This is a free event, being held online. This event was organized in partnership with Drs. Sue Alman and Sandra Hirsh from the San Jose State University School of Information as part of their IMLS-funded investigation of the potential uses of blockchain technology for the information professions. Speakers include: Dan Blackaby, Todd A. Carpenter, Frank Cervone, Christina Cornejo,Miguel Figueroa, Patricia C. Franks, PhD, CA, CRM, IGP, Toby Greenwalt, Jason Griffey, M Ryan Hess, Amy Jiang, Stacey Johnson, Bohyun Kim, Heather A. McMorrow, Eric Meyer,Robert Norton, Tonia San Nicolas-Rocca, Ravi Singh, and Link Swanson. Blockchain technology has the potential for libraries to accomplish much more than housing electronic credentials. The technology enables a broader impact within the community and around the globe. Some suggestions being explored for blockchain applications in libraries include building an enhanced metadata center, protecting Digital First Sale rights, supporting community-based collections, and facilitating partnerships across organizations. This mini-conference will provide participants with an overview of blockchain technology and information about current applications within the information professions. Join the discussion on ways that blockchain technology can be used in libraries. https://ischoolblogs.sjsu.edu/blockchains. See below for a list of the mini-conference topics, and full descriptions at http://www.library20.com/page/blockchain. We invite all library professionals, employers, LIS students, and educators to participate in this event. Participants are encouraged to use #library2018 and #libraryblockchain on their social media posts leading up to and during the event. What Might Standards for Library Blockchain Systems Look Like? Are you a tech leader at your school? Do you want to be more than “just tech support”? 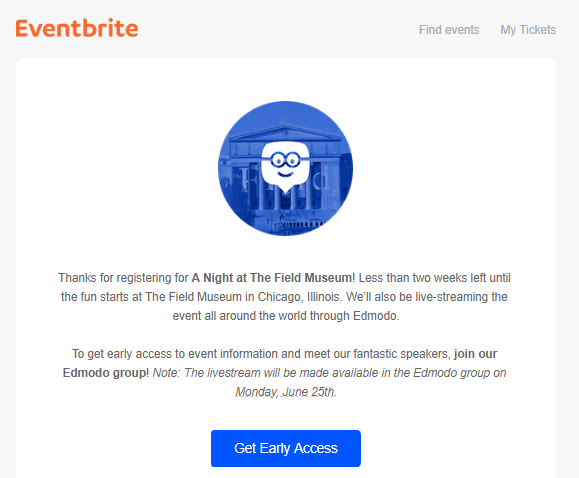 Join Edmodo and friends for A Night at The Field Museum with interactive learning and networking! Find out how to lead tech adoption at your school and get some PD hours while you’re at it. After the workshop concludes, relax with drinks and explore the museum! If you’ll be in Chicago, join us live on Monday, June 25th! Can’t make it in person? You’ll be able to participate remotely in the workshop. Register now on Eventbright to stay in the loop. 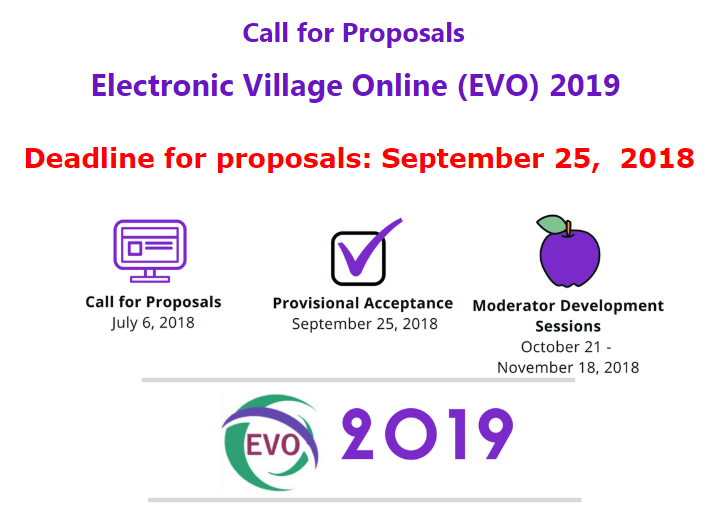 The purpose of the 7th annual 3-day online conference is for educators to engage in learning best practices and challenges involved in teaching and learning face-to-face and online (blended and fully online learning) using Moodle and other technologies. The theme of MMVC18 is teaching and learning with or without technology. MMVC18 will take place on Moodle MOOT Integrating Technology. Enrol in MMVC18 to get access the content before and after the conference, get your badges, final certificate for reflecting and presenting. Recordings will be available to those who enrol on the LMS Moodle platform. This fourth-annual Global Collaboration event is a huge worldwide demonstration of the power of globally-connected learning. We encourage you to browse the event directory or the calendar and choose a compelling event to attend! Read directions and our website carefully to prepare. A current list of the events is at the bottom of this post, but use the links below because new events will be added and others may change). Special thanks to Qatar Foundation International and TakingITGlobal, our sponsors this year! Here’s an update on Global Collaboration Week! We have over 1000 participants and 500 schools registered from 85 countries. 44 projects are being hosted this week, too, by global educators and organizations from around the world! Take a look at the following links for GCW. Please save this information for future reference. -Contact individual project/event hosts with specific questions. -Follow us on Twitter at @GlobalEdCon for updates. Our event hashtag is #globaled18. -If you need help, please chat with us here: http://bit.ly/GCW2018chat. We will respond as soon as we are able. Thanks, and please let us know if you have any questions! Let’s go global! Global Collaboration Week 2018 had over 1200 individuals and 585 schools and organizations from 90 countries registered. 47 projects were hosted this week, too, by global educators and organizations from around the world. We deeply appreciate the professional generosity of our event hosts. Their work has impacted thousands of students and teachers and together, we’ve helped raise awareness of the need to develop global competence in teachers and students. 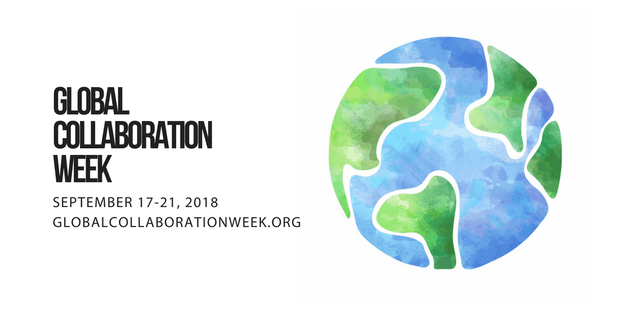 If you participated in a project listed on the Global Collaboration Week site, you can receive a certificate of participation by filling out this form. Many projects did not require live participation and these asynchronous projects may still be going on if you and your students would like to join in http://bit.ly/GCWasynchronous. Follow us on Twitter at GlobalEdCon for updates and continue to use the hashtag is #globaled18 to share ideas and resources. Post any photos, videos, and blog posts about GCW on Twitter to share with the global ed community! On March 15th, 2019, we will be co-hosting our fourth Global Leadership Summit with ASCD in Chicago at their Empower 19 conference. Registration for this event will be opening soon and make sure to reserve your space as this event sold out quickly last year! If you represent a corporate or non-profit organization, please consider supporting our work so that most of our events can remain free for teachers. Contact Steve Hargadon at hargadon@gmail.com for a conversation on how we can partner. Get a quick refresher in the Edmodo Basics Webinar, hosted by expert educators in our community. Who knows what you’ll discover with hands-on training from the comfort of your couch? We’ve got two upcoming sessions! Register above.